Microsoft and Oculus VR held a press event yesterday to demo Minecraft on the Gear VR for the first time. Oculus' chief technical officer, John Carmack, was on hand to give his thoughts, and it turns out he's been strapping smartphones to his face for a while now. But the demonstration showed that the game is still not quite performing up to its potential. The reason the Gear VR is the ideal platform for Minecraft, Carmack said, is because there are no wires tethering the user to a computer. With all the processing power built into the headset itself — in the form of a Samsung smartphone — there's nothing holding the user back from moving in any direction. 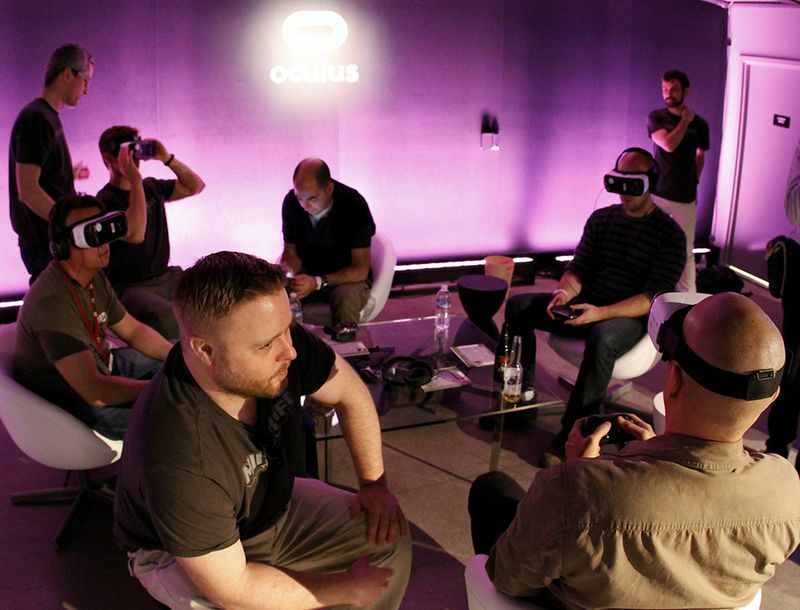 To enable that kind of experience, the demo space was littered with spinning office chairs and Gear VRs fitted with Samsung Galaxy S7 phones. But while Minecraft has been up and running on the Gear VR for some time, it still has no release date. Looking at Minecraft: Pocket Edition side by side with Minecraft on the Gear VR, it's easy to see why; right now, the view distance is remarkably shorter in VR. The play space designed for journalists to experience was very narrow. While the frame rate was acceptable — I had no issues with nausea — the grand vistas I've come to appreciate in Minecraft were almost entirely absent. Once I broke free from the prepared environment and ran off into the world, I immediately noticed how details were only visible out to a stone's throw away, a distance of perhaps 40 or 50 blocks. Past that, the edge of the rendered space manifested itself as an opaque white wall. Underground, in the pitch dark, that wall actually lit entire caves, meaning I could glitch the game into giving me enough light to see. Inside the prepared environment, it seemed as if I could see farther up and down than I could see out into the distance. Despite these technical issues with view distance, the locomotion system was particularly well-refined. Jumps had been smoothed out, and felt more like mantling obstacles in a third-person shooter than leaping into the air. That freedom of movement was a recurring theme in Carmack's short speech. Carmack closed by reaffirming his belief that Minecraft would be available in VR for consumers very soon.